Choose View > New Quick Note. Repeat the previous steps for any additional Quick Notes that you want to create. You can move Quick Notes anywhere on your screen and leave them there for as long as you need to refer to them. When you’re done with a Quick Note, close its window. Note: Closing a Quick Note window does not delete the note. Like regular notes, OneNote automatically saves your Quick Notes as soon as you’ve created them and whenever you edit them. Quick Notes are stored in the Unfiled Notes section in your default notebook. You can find them quickly by opening your Notebooks list (click the down-arrow next to the name of your notebook and look at the bottom of the list for Quick Notes). 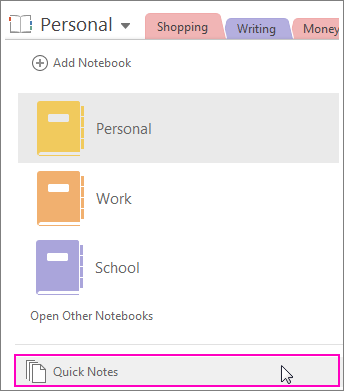 You can create a Quick Note even if you haven’t opened OneNote. On your keyboard, press Windows+N. Type your note in the small note window. To open additional Quick Notes after OneNote running, press Windows+Alt+N on your keyboard. If you’re using Quick Notes to keep small reminders and important information visible at all times, you can pin them so that they stay visible over any other windows on your computer screen. Move each pinned note to the position of your screen where you want to keep it displayed. To stop a note from being pinned to the top of your screen, repeat step 1 (the button is a toggle). No matter how or when you created them, you can easily look through all of your Quick Notes whenever you want. Near the top of the current page, click the name of your current notebook (for example “My Notebook”). At the bottom of the Notebook list, click Quick Notes. In the Quick Notes section, click the tabs of the pages you want to review. You can keep Quick Notes filed in the Quick Notes section, or you can move selected notes to other parts of your notebooks. To move a page, right-click the page tab, choose Move or Copy, and follow the prompts. 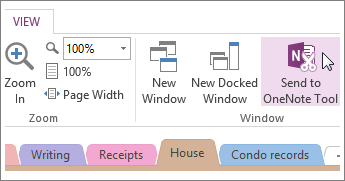 Click View > Window > Send to OneNote Tool > New Quick Note. Type your note in the small note window. You can format the text by using the commands on the mini toolbar that appears. Note: Closing a Quick Note window does not delete the note. Like regular notes, OneNote automatically saves your Quick Notes as soon as you’ve created them and whenever you edit them, so you can refer to them later. Quick Notes are stored in your notebook’s Quick Notes section, which you can get to from the bottom of your Notebooks list. On your keyboard, press Windows + N.
When the Send to OneNote window appears, press N to create a new Quick Note. You can format the text by selecting it and then using the commands on the mini toolbar that appears. Repeat the previous steps for any additional Quick Notes you want to create. (You can do this faster by pressing Windows + Alt + N on your keyboard). Note: Even when OneNote isn’t running, any Quick Notes that you’ve created are automatically saved to your notebook’s Quick Notes section. In any Quick Note that you want to keep visible, click View > Always on Top. To cancel pinning a note to the top of your screen, repeat step 1. Repeat the previous steps for any additional Quick Notes you want to create. You can keep Quick Notes filed in the Quick Notes section, or you can move selected notes to other parts of your notebooks.